This book offers a clear, yet comprehensive guide to how to structure a design project, focusing in particular on the key questions designers, architects, policy makers and health professionals should consider when working towards inclusion through design. The book is based on a series of lessons held by the author and his colleague Avril Accolla, whose aim was to train technicians at all levels to be capable of catering for the needs of the elderly. 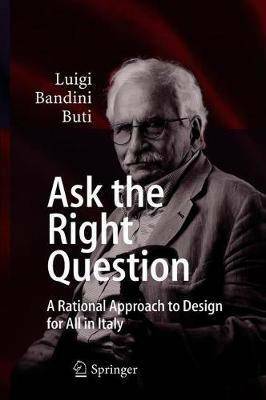 It clearly draws the outline of their Ask the Right Question approach, whose purpose is to help convey the notions in question appropriately to people with such widely different backgrounds, curricula, interests and cultures. Using a minimalist approach, based mainly on the discussion of eye-catching real-life examples placed in logical order and a crystal clear, engaging style, this book is a must-have for designers, technicians, customers and health practitioners, as well as social scientists and policy makers who deal with inclusive design at different levels and anyone interested in topics related to technological evolution and social integration.